Gluten Free Peanut Butter & Jelly Cookies | Great gluten free recipes for every occasion. From time to time, my 3 school-aged children will beg for PB&J on homemade gluten free bread for lunch. It seems like such a simple thing to make for lunch, so time-tested, and since the peanut-allergic kids have their own lunch table we’re allowed to send in peanut butter. So why do they have to beg? I think it has something to do with my cooking and baking for a living, and the fact that PB&J seems to me like the lunch you make when you have run out of options. In camp, it was always the lunch you could go make for yourself when you didn’t like the prepared lunch. All I’m trying to say is, I have a bit of a PB&J sandwich hang-up. 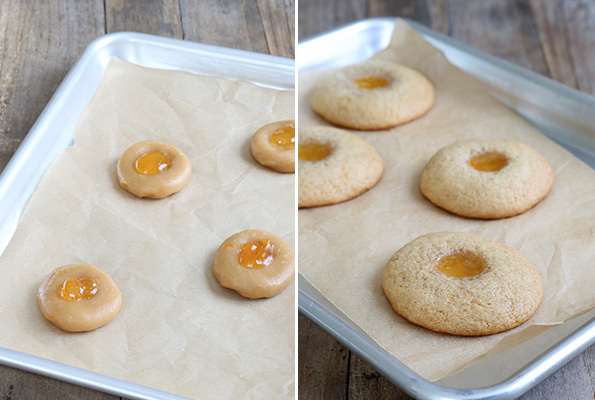 Enter gluten free peanut butter and jelly cookies. So I can send my kids with a mom-preferred sandwich or wrap, and they can still have their PB&J. 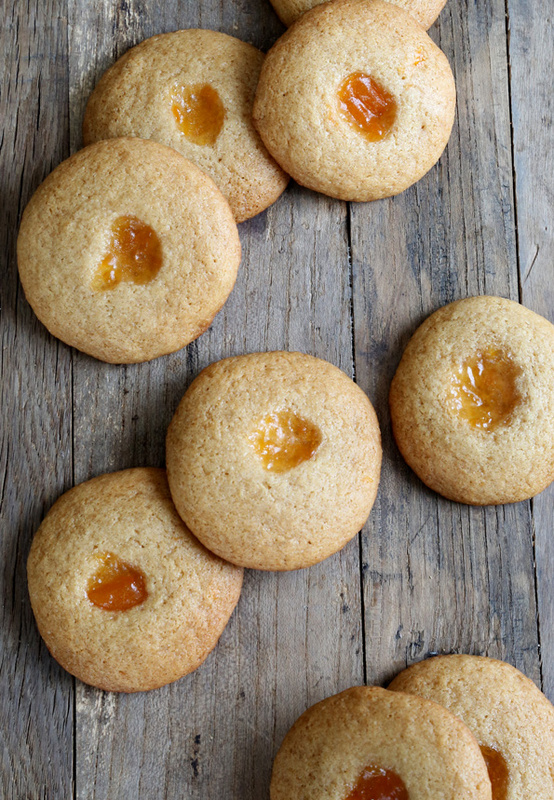 Believe it or not, it took a little while to come up with a recipe for these cookies that seemed worthy of the title. Most PB&J cookies are just, well, “regular” soft vanilla cookies, topped with a layer of peanut butter and a layer of jelly. That’s not a PB&J cookie. That’s just half a PB&J sandwich. These have both peanut butter and jelly baked into a soft, tender cookie, and an extra little jelly on top, for good measure. Bite it properly, and you’ll get just that wee bit more jelly in every mouthful. 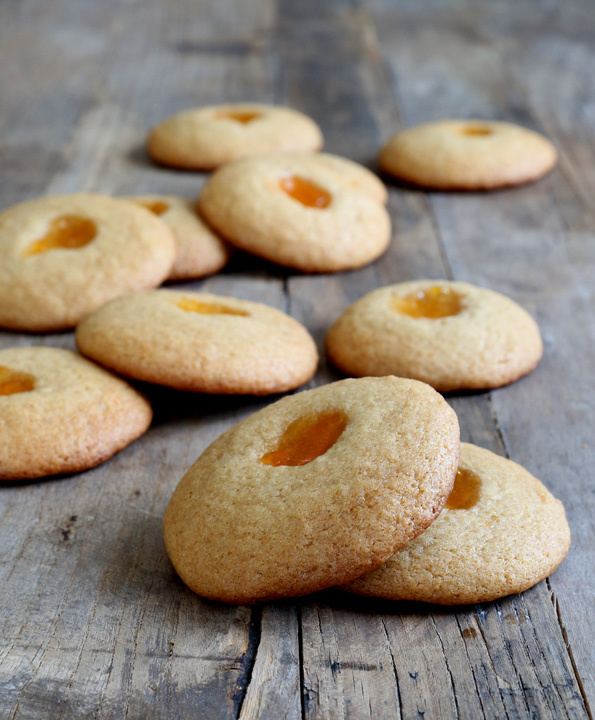 As the jelly on top bakes, it dries out just enough that the cookies don’t have to be treated like delicate little flowers. They can be stacked, or piled into a baggie for lunch. Now my kids get to have their PB&J, and I get to keep my hang-up. In a medium-size, heavy-bottom saucepan, place the butter, peanut butter and 3 tablespoons of the jelly. Heat over a medium flame, stirring frequently, until everything is melted and smooth. Set aside to cool briefly. In a large bowl, place the flour, xanthan gum, baking soda, salt and granulated sugar, and whisk to combine well. Add the brown sugar, and whisk again to combine, working out any lumps. Create a well in the center of the dry ingredients, add the peanut butter mixture, and mix to combine. Add the egg and egg yolk, and the vanilla, and mix again to combine. The dough will be smooth and thick, but very soft. Divide the dough into 12 equal pieces, and chill in the refrigerator until firm (about 10 minutes). With moist hands, roll each piece into a ball and place 2-inches apart on the prepared baking sheet. Flatten each into a disk and, with wet fingers, create a small well in the center to hold the jelly. Place the remaining 2+ tablespoons of jelly in a small, heat-safe bowl and microwave for 10 seconds or until it begins to thin and become pourable. Place a dollop of jelly in the well you created in each piece of dough. Place in the center of the preheated oven and bake until golden brown all over (about 9 minutes). Allow to cool on the baking sheet for about 10 minutes or until firm before transferring to a wire rack to cool completely. P.S. Don’t forget to pick up your copies of the Gluten Free on a Shoestring Cookbooks! Remember, a new one’s coming next year! Only yesterday I asked the girls which cookie recipe would you like to start off the school year? Strike is still on, preparing myself for the task at hand. Looks divine, friend! Thanks for another great recipe. Your blog is the highlight of my day! Making cakesters with my kids this week thanks to your fab recipe! Aw, thanks, Jennifer! So grateful for your support, always. Love those cakesters! Those are totally perfecto for lunchboxes.